The previous post led me to spend quite an enjoyable day exploring the works of Kandinsky and Gris. There is a natural progression that leads from the works of Monet up through Van Gogh, Matisse, Picasso. Kandinsky knew Picasso. He was in Paris in 1906-1907 and later was instrumental in arranging an exhibit of Picasso's work in Munich. Gris moved to Paris in 1906. I don't find that they knew each other, but back when we were reading Stein, it seemed to me that the circle was fairly small. It seems they must have met. 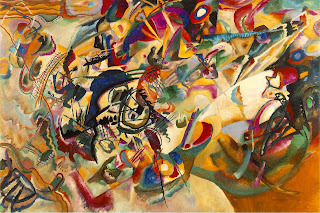 Kandinsky's art tells a lot about his journey. The early works are reminiscent of Russian folk art. 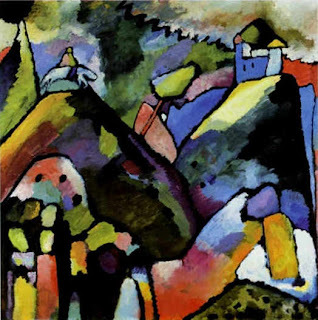 In works beginning around 1909, after Paris, there is a shift in Kandinsky's use of color. 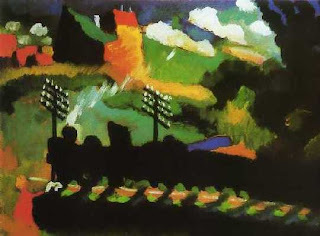 (View with Railway and Castle, 1909) At this time, he begins to use color independent of subject. His palette seems to be influenced by the ideas of the Fauvists...which brings us back to Gris and Picasso. The next three images are interesting for me from a compare and speculate point of view. 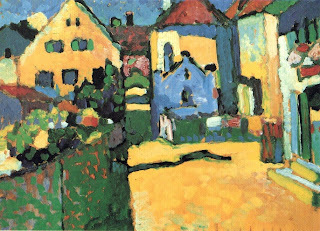 First, Kandinsky's 1909 Grunggasse in Murnau. Next is his Improvisation 10, 1910, which seems to revisit the Grungasse, at least in regards to the blue house motif. And now for the speculation. 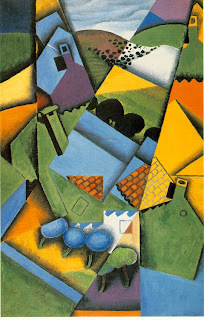 Here is Gris' Landscape at Ceret, 1913.